A reminder email arrived a week before our flight with reminders about dates and so on, but of course also making sure we'd remember to purchase the add-ons. The cabin was very comfortable thanks to the ambient lighting levels and humidity control. Make sure you have an empty drink bottle with you when you go through Security so you can fill it with water before you board. Water is very expensive on-board. The food is average at best. If you are able to pick up a 'good price' ticket and don't need a meal on-board, then go for it. 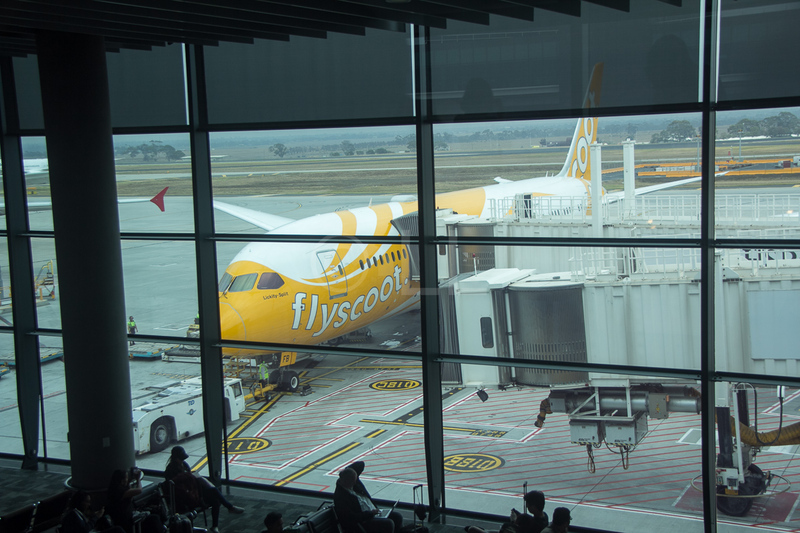 We flew Scoot Airlines Singapore-Melbourne overnight flight TZ22 in early March 2016. The flight pulled back from the bay at Singapore’s Changi Airport a couple of minutes after 12.40 am, arriving at Melbourne’s Tullamarine at the Australian Eastern Summer time of 11am. **Please note: Daylight saving ends in NSW, Victoria, Tasmania, ACT and South Australia the first Sunday in April, when clocks go back one hour at 3:00am. Daylight Saving starts again on the first weekend of October. Our return flight to Singapore took us out of Gold Coast airport in Queensland. Making the booking was smooth. This writer took advantage of the Tuesday specials and picked up a good deal for a basic fare. 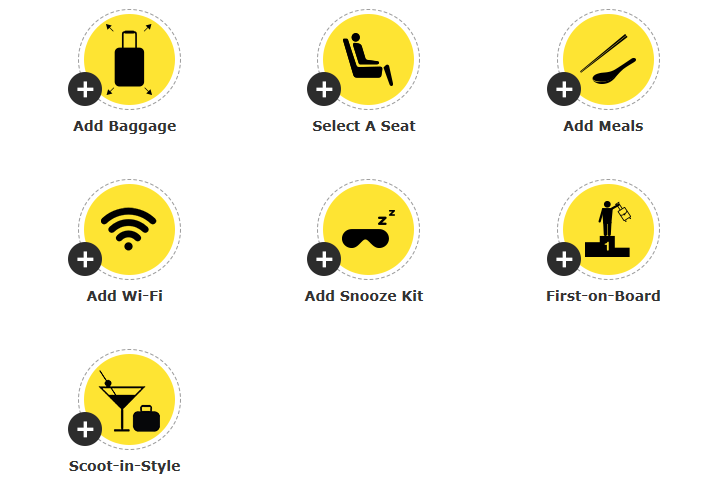 It was also easy enough to add the FlyBagEat option which included an Economy seat, 20kg check-in baggage and Meal, Drink and Snack for SGD57. I also decided to take the SGD12 ScootinSilence option as it was an overnight flight. Early Check-in on Scoot flights for SGD5 per passenger is available if you arrive with lots of time and want to explore Singapore. This means that you can in any time after 9am for a flight leaving m the next day. No need to carry your baggage with you or put it in storage. The plane is new – the entire Scoot fleet is made up of ten Dreamliners with two more on order, with an average age of less than a year (at the present time). Our aircraft was delivered in August 2015. Our seats 6A & B in the ‘silent’ section are standard seats with a width of just under 19″ (67cm) with the nine seats in each row arranged in threes with two aisles. With the streamlined armrests, this makes the available space comfortable for most average sized passengers. 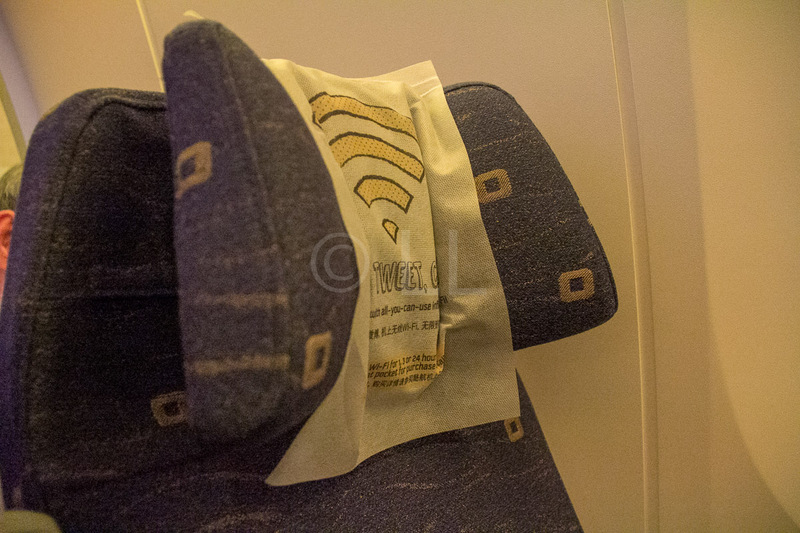 The cloth covered seats were comfortable and reclined adequately without impacting on the passenger behind. 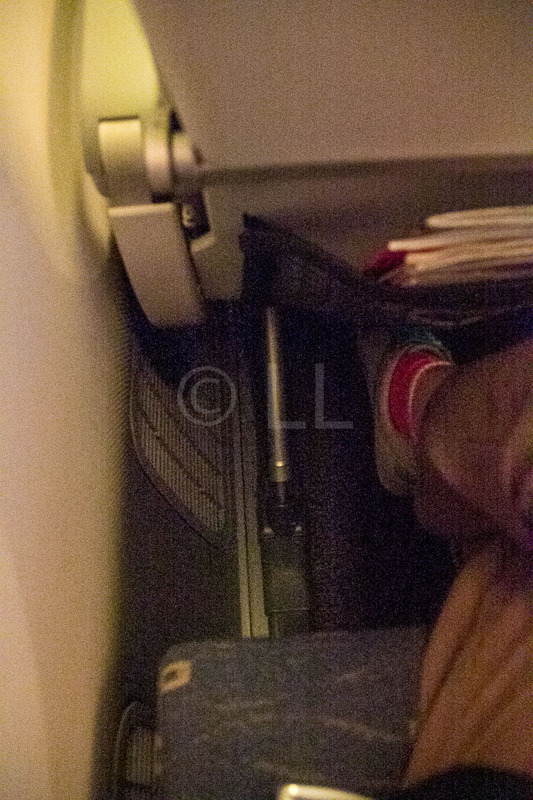 The extra legroom in this section was appreciated when stretching out to sleep. Particularly appreciated were the ‘tuck-around’ headrests that actually stayed in the preferred position when they were adjusted. In addition, they were thick enough to give the necessary support. However, if you’re not tall, your head may not reach the headrest when the seat is reclined. The armrests are slim and tuck away neatly into the gap between the seats even when the seats are fully reclined. 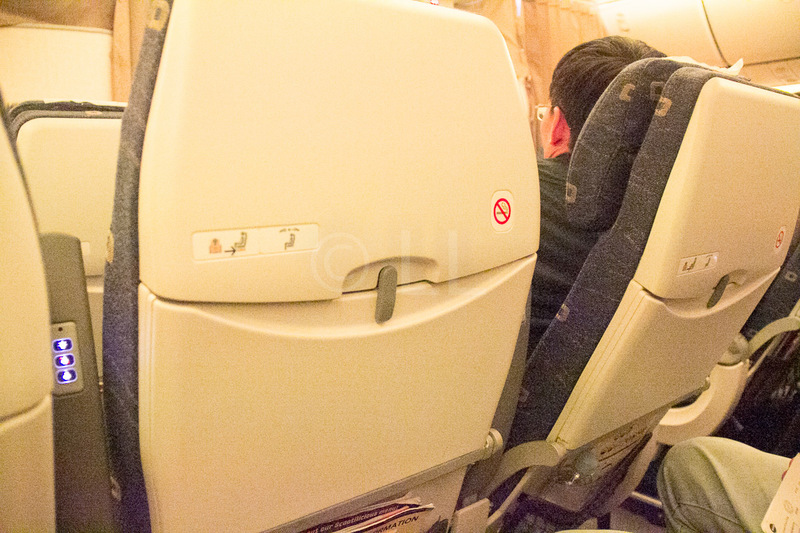 The only downside associated with the armrests is that the light and call buttons are located on top, we were not the only ones to have to apologise for unknowingly calling the cabin crew. The light button seemed to be the easiest to accidentally press. There is a hard to find (and then plug anything into) charging socket beneath the seat. However, you need to pay between SGD5 and 8 to use them. The legroom of 11″ was quite generous, making it easy for the long legged, but also a little more convenient for window and middle seat passengers to get out. Unfortunately, there is no footrest. Entertainment is not available on this service. The absence of the Entertainment unit means that there is no under-seat box reducing foot room for window seat passengers and the seat design is thinner as there is no seat back screen. The fold down table is spacious with a recessed cup holder and there is paid-for power available beneath the seats. 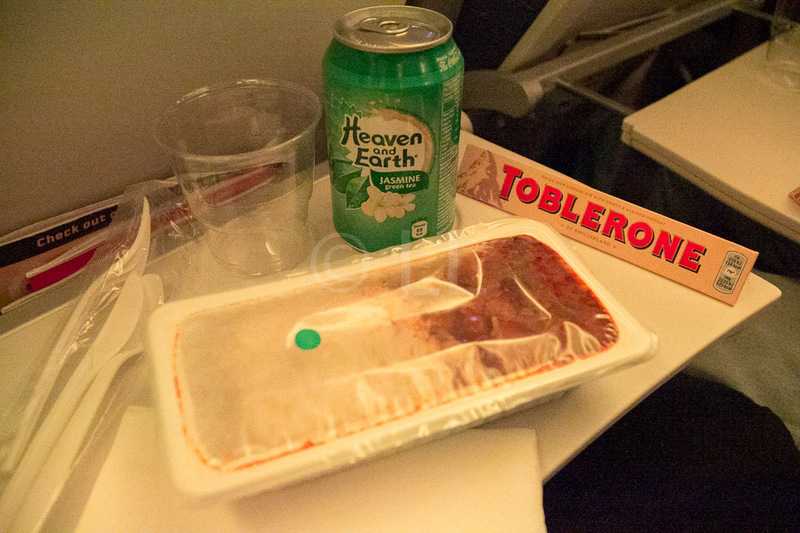 Having pre-ordered meals for my companion and myself as part of our FlyBagEat option, the meal arrived with a drink (canned coke or green tea) and a chocolate block. Sadly, my Braised Chicken with rice and my companion’s Nasi Lemak looked almost identical – rice with a similar dark brown stew. In both cases, the ingredients in the ‘stew’ were indistinguishable from each other – a mass of brown lumps in a thick sauce. The rice was not bad, so that part of the meal was finished. 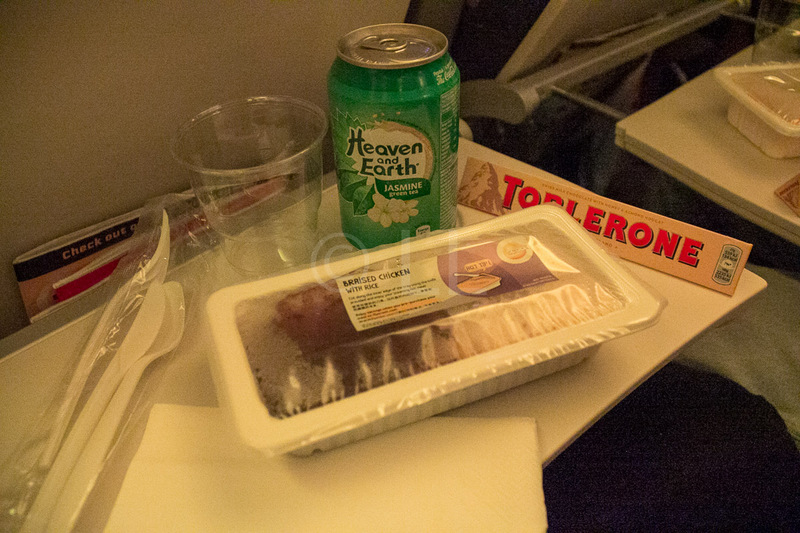 The meal served did not look anything like the meal pictured in the on-board /online menu. As a result, I would recommend having a good meal before you board and look for something once you arrive. The prices for on-board offerings are quite high for a rather limited menu. A small bottle of water goes for SGD4. Update November 2017: Scoot have revised their menu offerings and the updated food choices look very appealing. Feedback is most welcome in our comments section. 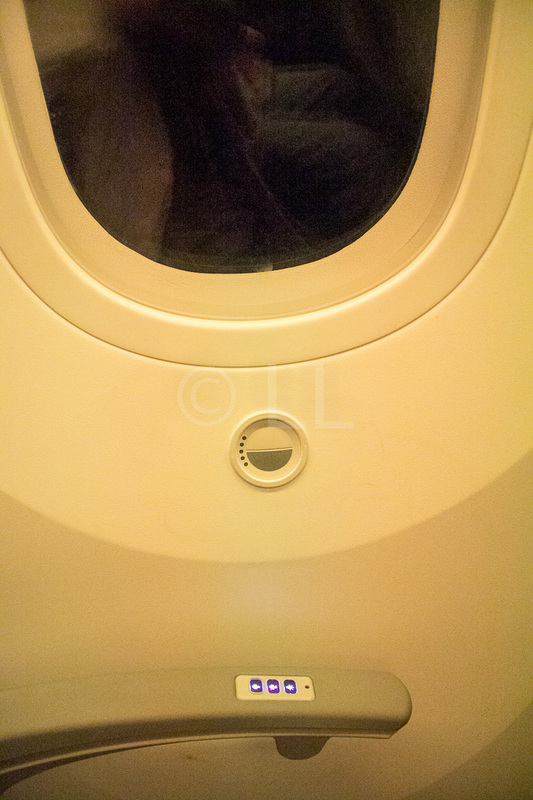 The much vaunted Humidity control in the Dreamliner is a great innovation which made it much easier to sleep comfortably and not wake with dry eyes, nose and skin. The temperature control was effective and also contributed to improved sleep quality. Cabin Lighting is very comfortable. The colours change almost without passengers noticing, cycling through a variety of colours. 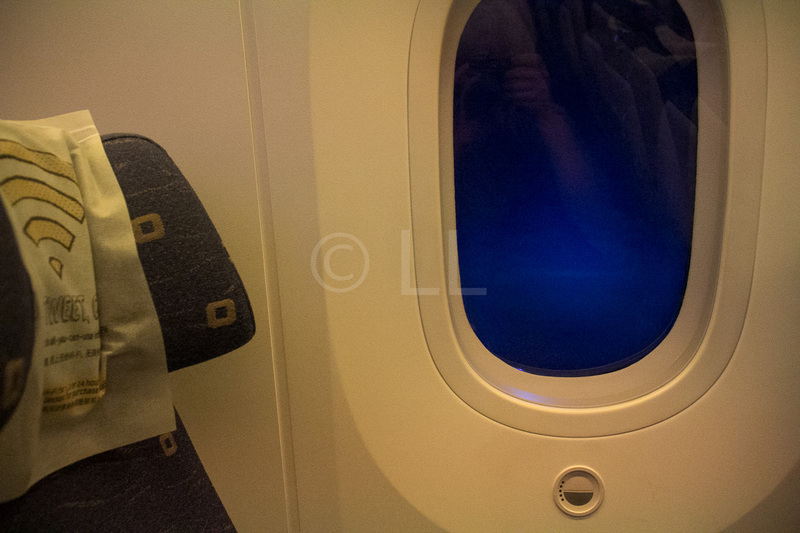 Unless you look at the lighting strips at the side of the cabin, you may not even notice. The electronic window shutters make a lot of difference when the sun is angling in after sunrise/before sunset. Unfortunately the shading was centrally controlled and I was unable to actually test the control set into the wall below the window. As one who enjoys watching the passing scenery, I found this quite annoying as the shutters weren’t ‘raised’ until about an hour before we landed and the sun was well into the sky. Add-ons available on board – The seat headrest cover and info in the seat pocket advise you that you may upgrade your seat size from SGD17 and purchase unlimited Wi-Fi for 1,4 or 24 hours from USD11.95. Bathrooms – our cabin had one bathroom available. It was cleaned often but the cleaning liquid smell was quite strong. Lighting is natural and there seemed to be a little more space than on some older aircraft. Taps are sensor controlled, with press controls for water temperature. The cabin was quiet and flight was smooth. 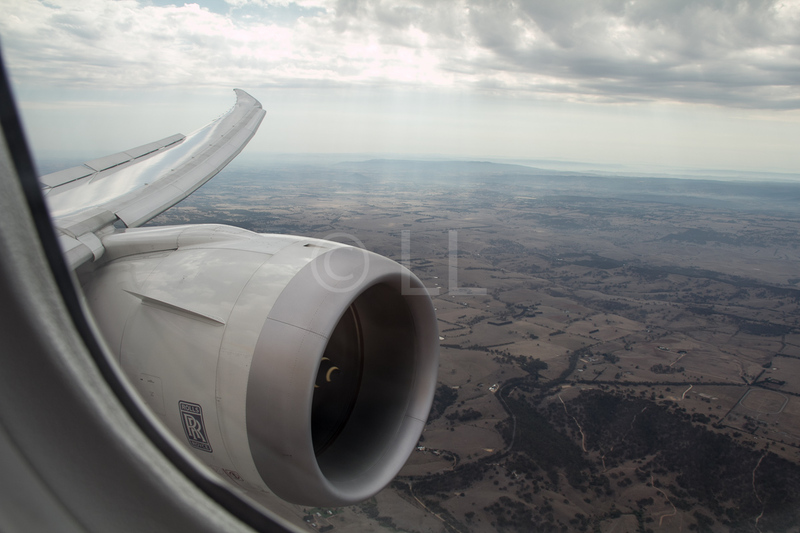 Engine noise was not obvious, although the air-conditioning noise was audible it was not too badly intrusive. 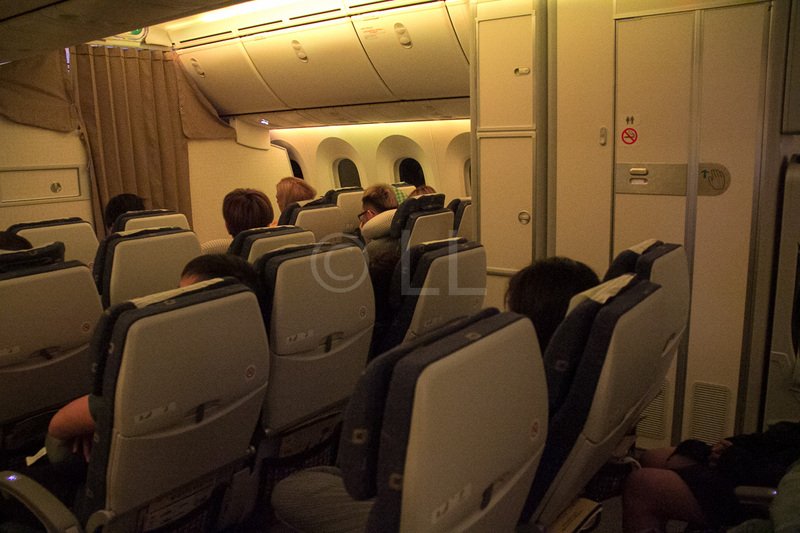 Announcements were clear and easy to hear, the reduced cabin noise was helpful here. Get your water before you board! We were wondering why we passed a long queue of people filling water bottles as we boarded in Singapore. When we saw the price of the small bottle of water (SGD4) we realised why! There is no water available on board other than the for-sale bottles. Make sure you’ve booked meals and all the baggage you need before you fly. If you’ve got more luggage than planned, it will cost you more to add after your initial booking, but still a lot less than having to pay at the airport check-in.